I met a group of guys at Safari Club many years ago. There was one particular gentleman that always came by our John X Safaris booth, year after year. He’d talk about bringing his friends and joining us on a hunt, for one reason or another something always came up. They never made it. January 2011 rolled by and we were back in Reno for SCI’s national convention, the same gentleman came strolling up the aisle. I turned to the rest of the crew in the booth; “Anybody interested in placing a small wager on the elderly guy booking a hunt?” Silence. I repeated my question again, I knew Fredo well enough, he’s a betting man, and I’d seen him far too often hitting the $¼ slots at the hotel. “Boy”, Fredo continued,”A $1 says he’s booking“. You’re on Fredo, I replied. Bill Satterfield strolled up to the booth, shook my hand, introduced me to a buddy of his, Dave Kjelstrup, and booked two hunts. He then signed up another friend, Alex Good, who wasn’t even there?! OK, pause – rewind… What just happened here?! Never the less, July was upon us before we knew it. 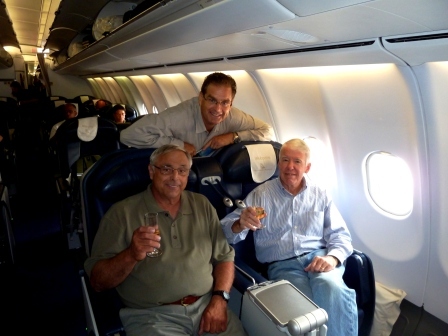 Bill Satterfield, Dave Kjelstrup, Alex Good and Paul Latchford were due to arrive on the last connection from Johannesburg to Port Elizabeth. 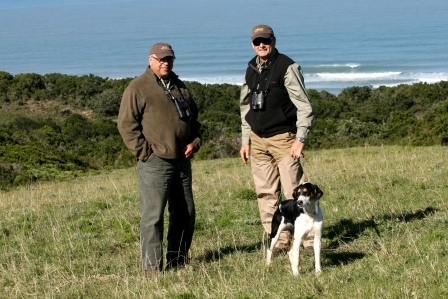 For Dave, Alex and Paul, this would be their very first African hunt, while Bill was a seasoned African bird hunter and traveler. Having left the airport, while heading into camp I soon realized I’d chosen the perfect Professional Hunter to join me on this hunt. The guys had come to hunt hard with rifle, shotgun and bow, while clearly stating their intentions of having fun! Dave and Bill would join me with my team, consisting of myself, my tracker, Boy, and our terriers, Bongo and Foxy. 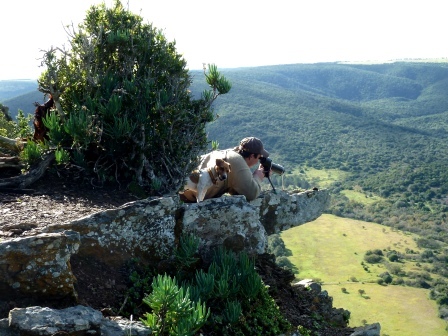 While Paul and Alex joined Professional Hunter, Juan MacDonald, together with his tracker, Joseph, and hunting dogs, Leica and Zippo. The first few days saw us hunting from our coastal region. Juan was after any form of plains game that came within bow range, while I was trying to ease Dave into African hunting before we took on his all important Cape Buffalo. We started off our mornings by selecting favorable vantage points, glassing for any movement in the surrounding valleys. We’d hardly sat down on that first day when Dave spotted his first “real” trophy of the hunt. 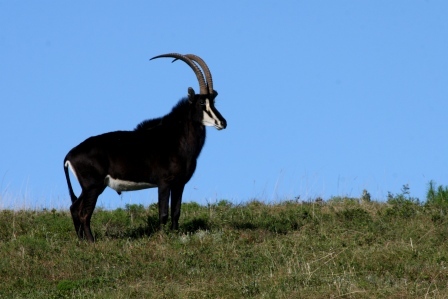 A magnificent Waterbuck bull 650 yards below our glassing position. And that’s exactly how our hunt and friendship started. I’d find something good and Dave would follow me wherever I needed him to go. 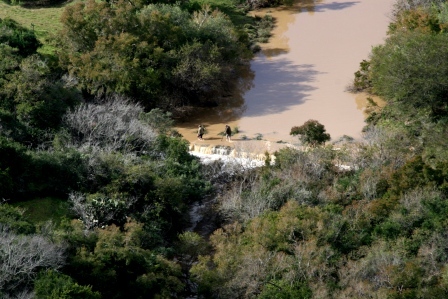 Alex and Paul, together with their team were hunting a few valleys over. 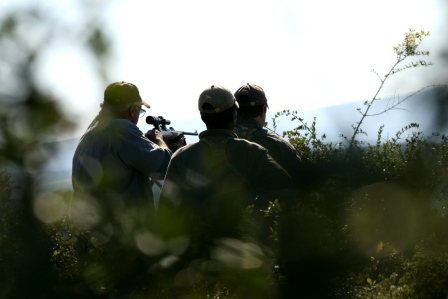 They had enjoyed a fair amount of luck in spotting game on that first morning too, stalking to within 35 yards of a good Cape Bushbuck ram. Unfortunately the ram got away, but they were now glued to their radio, listening to our progress on the Waterbuck. 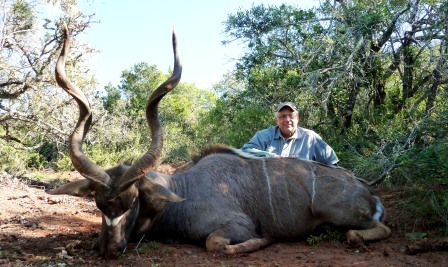 We finally came up empty-handed, taught a fine lesson in the art of hunting by a sly old Waterbuck bull. It would be one of few beatings we’d take on our hunt, in time it seemed Dave’s stars were aligned. Lady luck was in town and the hunting gods were smiling down on us. That afternoon saw the bow hunters come up empty-handed, having thrown a few arrows without any luck. 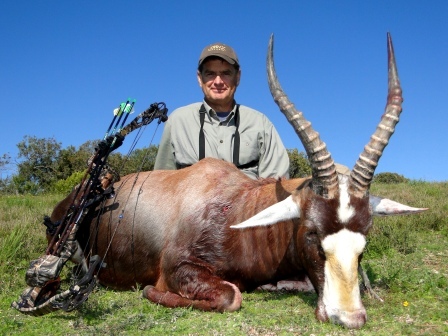 Dave on the other hand earned a world-class Nyala, and more importantly, got a kill under his belt. We would start Buffalo hunting the following morning. 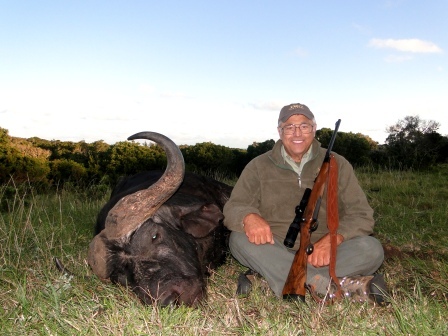 Right from the start, everybody in the hunting party had expressed their desire to be along on Dave’s Cape Buffalo hunt. We had told them that we’d see what we could do, but that hunting Big 5 was a different game, something not to be taken lightly. Both Juan and I were ultimately responsible for the entire hunting party’s safety. That 2’nd day started much like the first, glassing open patches where the coastal forest ran down to the Indian Ocean. We were battling to find Buffalo. There was activity, but nothing more than signs of a heard. We were after a Dugga boy. During the course of the morning, we did however bump into this beauty. Bill wasted no time capturing unbelievable shots with his camera. Having come up empty-handed for the morning, we decided to call a lunch break. It seemed we couldn’t have chosen a better spot for lunch. Half way through lunch saw a Dugga Boy step out to feed in the clearing below us. We wasted no time and Dave needed no second invitation in bagging a great Dugga Boy Buffalo Bull. 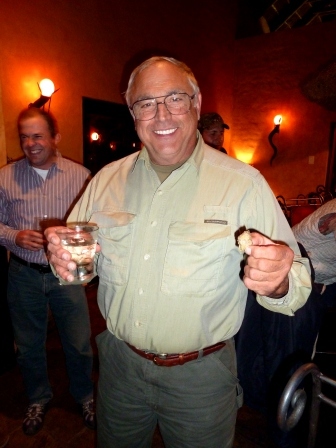 That evening we let tradition run its course with Dave enjoying the first piece of Buffalo B@ll$ and one of many Martini’s! Up until now, Alex and Paul had been fairly quiet, happy to take a back seat, sharing days with the rest of the crew. Day 3 saw all that coming to a sudden halt. We’d dropped off Alex and Boy in a quiet area to roam freely and hunt whatever presented an opportunity. 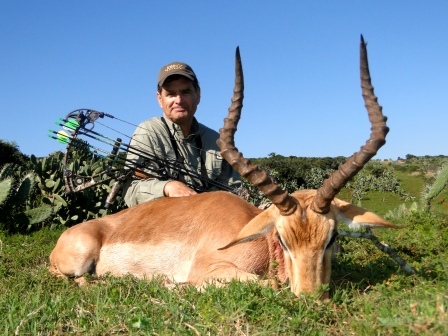 An old Impala ram soon stepped within range, earning Alex his first African bow kill. 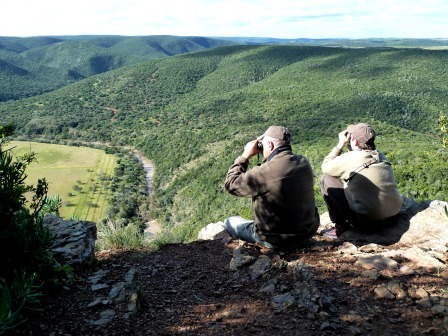 Dave and Bill, together with Carl were scouting an area about 5 miles away, on the hunt for an East Cape Kudu. 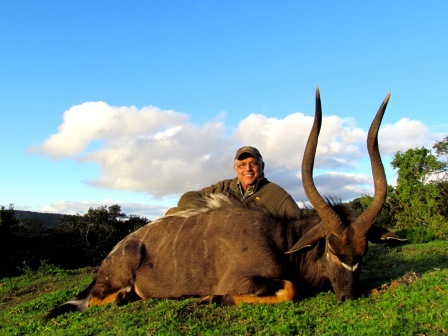 Having spotted a number of bulls that morning we felt confident about our chances, more importantly I knew we were hunting one of the finest Kudu areas in the Eastern Cape, an area that John X Safaris has been exclusively hunting for the past 20 years. Dave, Bill and Carl stalked up to the feeding bull from 700 yards out. The last 200 yards was tough going, often needing to crawl and force our way through rough country. At 80 yards I put up the sticks, Dave quietly settled his 375 and steadied himself. The bull turned, stopped to listen, and then continued feeding. Dave squeezed the trigger…. After packing out Dave’s bull, we convened for lunch after a busy morning. 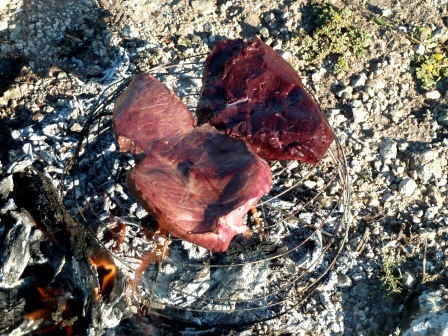 We enjoyed our regular selection of sandwiches, but decided that fresh Kudu heart and liver cooked right there in the field would be a great addition to lunch for bunch of hungry men. For the remainder of the afternoon we planned on solely concentrating on hunting with Paul. It was day 3 and Paul’s luck was due for a change. 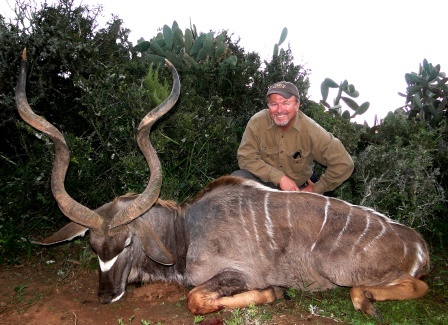 A great Kudu bull stepped out at the right moment, truly welcoming Paul to hunting in Africa. Day 4 saw us rising bright and early, splitting up for the day. 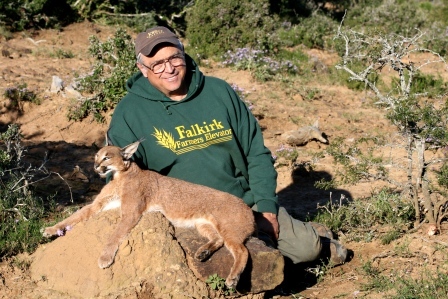 Juan together with his crew would concentrate on bow hunting, while Carl had the Lynx dogs running, hoping to chase up a cat. 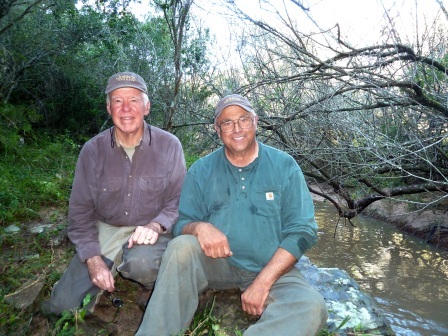 Both Bill and Dave found out that cat hunting is not only rough, but extremely tough. Caracal often prefer rocky cliffs and dense cover, making it difficult to keep up with the hounds. After a lengthy chase the hounds finally treed an old female. We had started at 7am; by the time we took this picture it was 14.30pm. The smile on this occasion was one of pure relief. Paul it seemed had only just warmed up the previous afternoon, day 4 saw him scoring with two bow kills, a Blesbuck and an Impala. His Impala was a beauty! Alex on the other hand wasn’t doing badly either. It seemed the bow hunters were kicking the rifle hunters’ behinds! 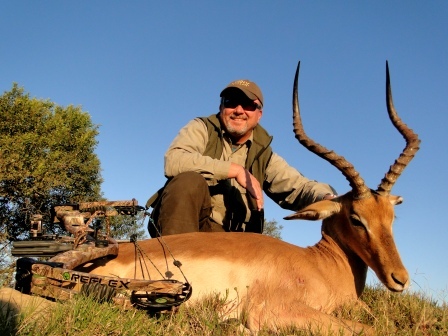 Now Dave had spotted a big Waterbuck bull that first morning, and I wasn’t about to forget about it anytime soon. 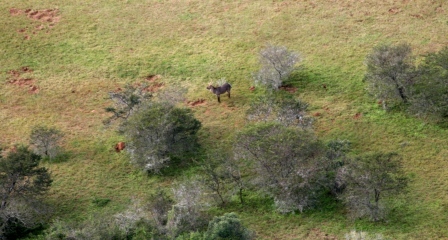 We returned to the same spot – hoping to spot the bull again. By 16.00 that afternoon we were yet to see “our” bull. At 16.20 my radio cracked to life, it was Boy, he’d spotted a Warterbuck in the distance, and it looked big. I gathered the guys and headed to Boys location. 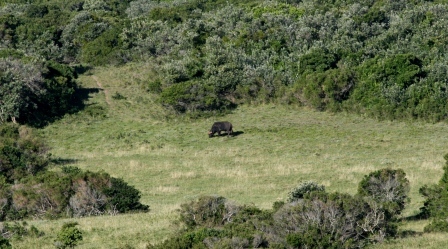 By the time we arrived with Boy the bull had fed away from the clearing and we were now too low to see him again. I had a quick discussion with Boy; he was adamant that we should move immediately, knowing him as well as I do, I decided to have him lead the way. Needless to say Boy led us with distinction – right to where the bull was feeding. The minute I spotted him I knew he was something special. This was a different bull to the one that we had spotted that first day. 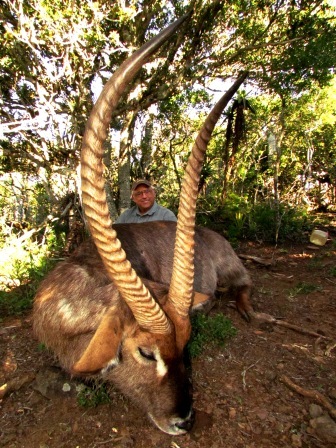 He was without a doubt the biggest I’d seen all season – a beast of a bull scoring over 30’’. 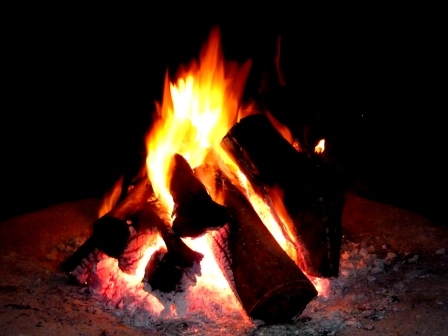 Our time in the south had been extremely productive, but there was still so much to experience in the north. Would they experience the great herds, mountains, and wide open plains? Would their luck continue?